Please feel free to attend my opening in Tel Aviv at Bazel Gallery on August 16th from 6-10 pm. Info is below. בתערוכה זו מוצגת סדרת עבודות חדשות שחוקרות וחושפות את השקפתה וראייתה הייחודית של אליס מזרחי. “דרך העדשה שלי”, האמנית מאפשרת לנו הצופים התבוננות בעולמה ובמסעותיה בעולם. מזרחי מביאה אל קידמת הבמה את מראות היומים המוכרים, הידועים והשיגרתיים ומחוללת בהם טרנספורמציה ותרגום מחודשים שמתבטאים בציוריה בעזרת: שימוש בקולאז’, רישום מהיר, עיוות וצבעוניות עזה מתוך מתן דגש לעולם ההדפס אשר עליו התחכנה. Powerhouse gallery, Colette, Fifty 24LA, Crewest, Intermedia Arts, Museum of Contemporary Art in DC and The National Women’s Museum in DC. קשרה החזק לאומנות רחוב ולעירוניות ניכר בעבודותיה ובציורי הקיר הגדולים אשר מעטרים את הערים ברחבי העולם. 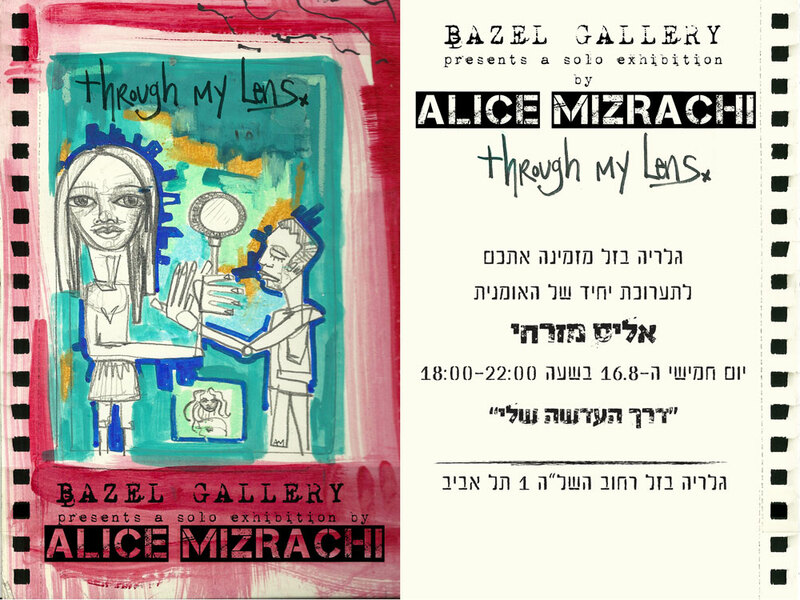 August 2012, Tel Aviv, Israel — This summer, Alice Mizrachi presents a series of new works that explore the artist’s vision. Through My Lens is an observation of people, objects and characters the artist sees on the streets and how she interprets them. Through My Lens will be on view at Bazel Gallery, 1 Hashlah Street in Tel Aviv, Israel, from August 16- September 16, 2012, with an opening reception from 18.00- 22.00 on Thursday, August 16. Curated by Bazel Gallery, this exhibition features work from a native New York street artist, Alice Mizrachi with a focus on figurative works. From her travels and people she meets on the street, Alice Mizrachi has captured the essence of each person shown with a raw sensitivity to color and line. Mizrachi’s vivid artworks interprets a magnified lens through which she observes individuals. “I am inspired by things I see on the streets; objects, personalities, faces, and ways of life. I aim to capture the emotions of the individuals I see with a spontaneous rhythm” . Alice Mizrachi is a Queens based artist, curator, educator and community organizer. With a focus on the figure abstracted through color, line and pattern, Mizrachi’s work draws from an inner reserve of spontaneous raw emotion. As a master of materials, grounded in painting and printmaking, her respect for the mediums she works with is as important as the charged imagery she creates. She has exhibited work in galleries and museums worldwide including Powerhouse Gallery, Colette, Fifty 24LA, Crewest, Intermedia Arts, Museum of Contemporary Art in DC, and The National Women’s Museum in DC and most recently in solo shows in Paris and Tel Aviv. With strong ties to the urban art world, Mizrachi’s early work focused on the vibrant tranquility of city life and earned her profiles in niche publications Giant Magazine, Juxtapoz and Square Rootz. In addition to work on 2D surfaces, she has painted murals worldwide and begun to delve into sculptural objects made from found materials. With over 10 years of experience as an Arts Educator, Mizrachi has merged all of her interests as co-founder of the YOUNITY Arts Collective since 2006. The all-female urban art collective produces a variety of creative enterprises annually including exhibitions, panel discussions, mural productions, and youth workshops. Mizrachi is also a graduate of the Parsons School of Design in New York City.